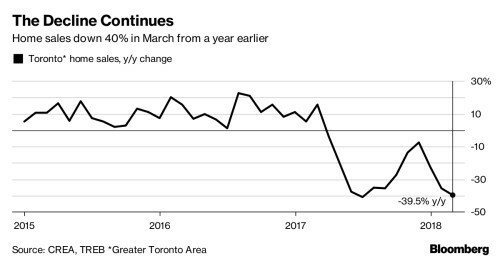 The high-end of Toronto’s housing market is bearing the brunt of declines from last year’s dizzying growth, with prices falling and unit sales slumping by almost half. Sales of detached homes in and around Canada’s biggest city fell 46 percent in March from the same month a year ago, while the average price fell 17 percent to C$1.01 million ($786,871), according to data released Wednesday by the Toronto Real Estate Board. That dragged down the average selling prices for all housing types by 14 percent from a year earlier to C$784,558, the biggest drop since 1991. “Detached home sales, which generally represent the highest price points in a given area, declined much more than other home types,” the board said in its monthly report. “In addition, the share of high-end detached homes selling for over C$2 million in March 2018 was half of what was reported in March 2017, further impacting the average selling price." Still, prices continued their stabilization of the past few months as homeowners get ready for the traditionally hectic spring season. Benchmark prices rose 1.2 percent in March from February, including a 1.1 percent gain for detached homes and a 1.8 percent increase in condos. Average prices also rose month on month. Benchmark prices fell 1.5 percent year-over-year, the first decline since 2009, led by a 6.7 percent drop for detached homes. Benchmark prices compare essentially the same set of houses from one period to the next, removing distortions from big swings in one category or another. Sales for the market as a whole, including condos, townhouses, and semi-detached homes, fell 40 percent to 7,228 units in March from a year ago but were up from February. That’s the lowest sales figure for March since 2009. Canada’s biggest housing market has been adjusting to new rules that make it harder for buyers to qualify for a mortgage, curbs on foreign purchases and rising interest rates. Federal and provincial governments have been gradually tightening market conditions to tame prices that skyrocketed last year. The second half of the year should see the annual rate of price growth improve as sales increase relative to the below-average level of listings, Mercer said. New listings fell 12 percent to 14,866 from March 2017 and were down 3 percent compared to the average for the previous 10 years.